For the first time in two decades, the Knights will send both the men's and women's basketball teams to March Madness' Big Dance in the same season. What’s better than one basketball team heading to the NCAA Tournament? How about two. 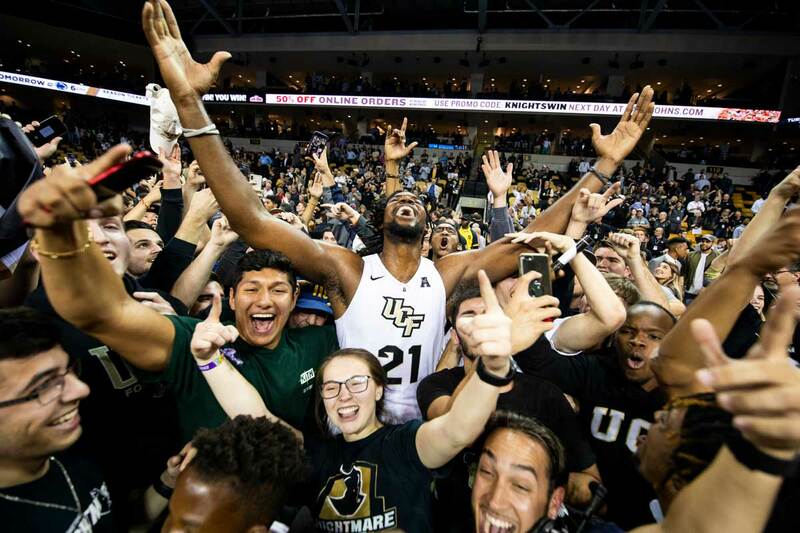 For the first time since 1996, the UCF men’s and women’s basketball teams will both be playing in the NCAA Tournament in the same season. UCF and Michigan are the only two NCAA Division I programs in the country this year who can boast to have had their football team compete in a New Year’s Six bowl game and both their men’s and women’s basketball teams compete in the NCAA Tournament. The women will face Arizona State in Coral Gables, Florida, at the Watsco Center in the first round Friday at 7 p.m. on ESPN2. The men’s tip off against VCU is slated for Friday at 9:40 p.m. ET at Colonial Life Arena in Columbia, South Carolina, on CBS. The UCF men’s basketball team is headed to the NCAA Tournament for the first time in 14 years. The ninth-seeded Knights heard their name called early in CBS’ Selection Show on Sunday evening when the bracket revealed UCF will square off against No. 8 seed VCU in the East Region on Friday, March 22, in Columbia, South Carolina. The winner of the first-round matchup will advance to likely meet top-seeded Duke on Sunday. Friday’s game will be the first time UCF has squared off against VCU on the hardwood. UCF is 23-8 in 2018-19, which stands as the most regular season wins in the program’s Division I history. During the season, the Knights earned multiple victories over top 25 opponents for the first time, winning at No. 6/8 Houston and topping No. 19/20 Cincinnati at home. UCF was ranked No. 25 in Associated Press national poll March 4, marking the program’s first appearance in the top 25 since 2011. The men’s basketball team has played in four NCAA Tournaments since joining the Division I ranks in 1984-85, but all of those years (1994, 1996, 2004, 2005) were a result of automatic berths by way of winning the Atlantic Sun Conference Tournament. Surrounded by their fans Sunday, the Knights gathered at BurgerU on campus for a watch party where they learned of their first-ever at-large berth — which came with their highest seed in school history — to the Big Dance. UCF is sharing the good news with the hashtag #GKMO (Go Knights, March On). UCF Athletics is selling a limited number of tickets for the first and second round of the NCAA Tournament. Fans can place their ticket order here, but orders are not guaranteed. The priority deadline for tickets is Monday at noon. A limited number of student tickets are available through a lottery system, but UCF students needed to sign up through ucfknights.com by Monday, March 18, at 5 p.m. to be eligible to purchase first-round tickets for $100. If you are selected, you will receive a confirmation email to complete the purchase. First-round tickets include the Duke vs. TBD game at 7:10 p.m. and the UCF vs. VCU game at 9:40 p.m. Note: You will only be charged for the tickets at the location UCF is selected to play in round 1 and if we are able to fulfill your order. If UCF advances to the second round, your card will automatically be charged for the same number of tickets. If you are there a day early, UCF will hold an open practice at Colonial Life Arena on Thursday evening. Open to the public and media, the Knights will practice from 5:40-6:20 p.m. following a press conference to promote the game. The official pregame pep rally will be at Tin Roof and The Senate just three blocks from Colonial Life Arena. The event will take place from 4:30-6:30 p.m. March 22 and feature live music, drink specials and massive video boards. Fans can register for the event in advance by clicking here or visiting ucfalumni.com for more information. If you can’t attend the men’s game in person but want to watch it with fellow Knights, UCF Alumni chapters and clubs are hosting watch parties in various cities around the nation. Locations will continue to be added on ucfalumni.com/watchparties as they become available. 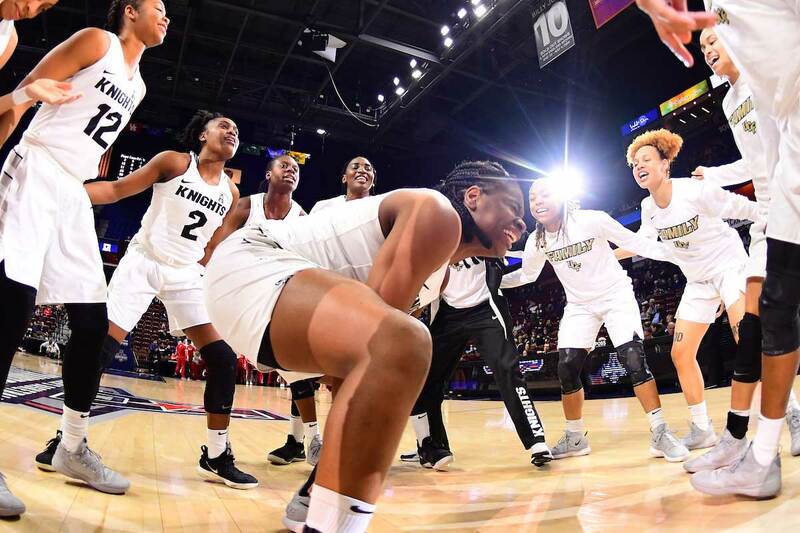 A week after the UCF women’s basketball team appeared in the American Athletic Conference Championship final for the first time since joining the league in 2013, the Knights heard their name called Monday for their fifth-ever NCAA Tournament berth. It marks UCF’s first trip to the Big Dance in eight years. The Knights earned a 12-seed — their highest in school history — and will face No. 5 seed Arizona State in Coral Gables, Florida, in the first round Friday at 7 p.m. on ESPN2. The winner of that matchup will advance to play the winner of Miami and Florida Gulf Coast on Sunday. UCF is 26-6 in 2018-19, which has already set the program record for victories in a season. The Knights have received votes in the USA Today/WBCA Top 25 every week this season and have received votes in the AP poll 10 times. Academically, of the 64 teams in the tournament, UCF is one of 29 teams that had a 100 percent graduation rate last year, according to an annual report released Tuesday by The Institute for Diversity and Ethics in Sport. The report, Keeping Score When It Counts, looks at the Academic Progress Rate and Graduation Success Rate of the Division I teams, according to Richard Lapchick, the primary author of the study and director of the institute at UCF. Each of UCF’s previous four NCAA Tournament appearances has come from automatic berths as conference tournament champions, having won two Atlantic Sun Conference titles (1996, 1999) and Conference USA titles twice (2009, 2011). Tickets are on sale now. Single session tickets are $15 for adults and all-session tickets are $25 for adults. For more information or to purchase tickets, click here.